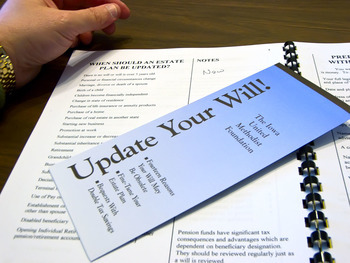 Wills are generally the centerpiece of an estate plan , allowing people to direct how their property should be divided and who should get it after they die. Anyone can create a will with an inexpensive software package or, if there are significant assets or a complicated plan for dividing your property, you can pay an attorney several thousand dollars to draft one a will. In either case, it's money well spent. Discourage your parents from trying to save money by having a joint will, in which each one leaves all money and property to the other. Each parent should have a separate will -- and consider covering the key points discussed below. 1. Name a personal representative or executor. In an individual will, your parent can name a person or institution to act as personal representative, called an executor in some states, who will be responsible for making sure that the will is carried out as written and that the property is divvied up and distributed as directed. It's also wise to name an alternate in case the first choice is unable or unwilling to act. 2. Name beneficiaries to get specific property. Your parent's will can specify separate gifts of property -- called specific bequests -- including cash, personal property, or real estate. Likely beneficiaries for such bequests are children and other relatives, but they may also include friends, business associates, charities, or other organizations. In fashioning their wills, most people assume that the beneficiaries they name will survive to take the property they've specified for them. The most thoughtful wills provide for what should happen if those beneficiaries don't survive -- either by naming a backup recipient or indicating that the person's spouse or children should take the property instead. Name someone to take all remaining property. If your parent has opted to make specific bequests of property, a will is also the place to name people or organizations to take whatever property is left over. This property is usu ally called a "residuary estate." Give directions on dividing personal assets. If your parent wants assets divided among children, charities, or other beneficiaries, the will should note precisely what property is included in that pool. It should also specify whether assets are to go directly to beneficiaries or whether they're to be sold and the value divided among the beneficiaries, either equally or according to stated percentages. Give directions for allocating business assets. Business assets are often separate from personal assets -- and most business owners have very specific ideas about what should be done with them after their deaths. If your parents don't have a written plan covering the windup of their business, encourage them to see an experienced estate planning attorney to ensure that their wishes are clearly indicated in each of their wills. Specify how debts, expenses, and taxes should be paid. The will should spell out your parent's wishes regarding how to settle debts and final expenses, such as funeral and probate costs, as well as any estate and inheritance taxes. Usually a specific source, such as a bank account, will be tagged to cover these costs. A nice added touch is that people making wills can use the documents to relieve those who owed them money from the responsibility of paying that debt -- along with any interest that accumulated on it -- to them or their survivors. Indicate special instructions for maintaining real estate. If your parents name someone to keep their house, they should list any specific instructions for its care and upkeep in each will. Provide a caretaker for pets. Since the law considers pets to be property, the best way for your parents to assure a good home for theirs is to leave the animal to someone named in each will who has agreed to give it a good home. Many people also leave that person an amount of money to help cover the caretaking expenses.